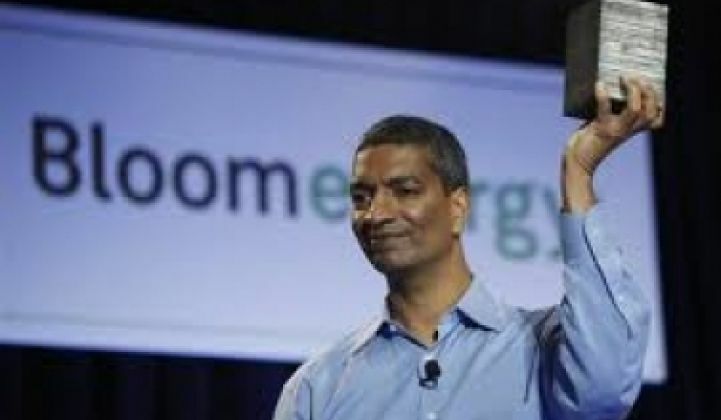 The software giant will get one-third of its power at HQ from Bloom Energy at rates that are one-third less costly. If you've wanted to see a test case for the Bloom Energy Server, here it is. Adobe, the software giant, has installed 12 100-kilowatt solid oxide fuel cells, or Energy Servers, from Bloom Energy at the Adobe headquarters. The cumulative 1.2 megawatts of power that the fuel cells generate will provide Adobe with about one-third of the power it needs to run the building. It will also cut Adobe's costs. The power from the fuel cells -- which is created by converting methane into electricity, carbon dioxide and water with a network of catalytic ceramic plates -- costs approximately 8.5 cents per kilowatt hour, according to Randy Knox, senior director of global workplace solutions at Adobe. "That is down from the 13 cents we would ordinarily pay PG&E," he said. The price includes maintenance, fuel and the amortized cost over the operative life of the fuel cell (ten years), along with the 30 percent federal tax credit and the California incentives available for companies that use the device. Adobe could further lower its costs by running standard methane through the system. Instead, the company has contracted to buy bio-methane from a landfill over a five-year period. Adobe contemplated installing more fuel cells, but it didn't have adequate room. Knox, however, said that Adobe is examining the possibility of putting Bloom boxes in other Adobe buildings in the state. Bloom is also working on a second version of its servers, he added. In two to three years, it may be possible to add more at headquarters. Knox told us that Adobe was looking into fuel cells running on biogas back in January when we visited to shoot a video of its urban wind turbines. Adobe enlisted a San Jose State professor to help it study fuel cells. Bloom won in part because its fuel cells primarily generate electricity and very little heat. Most conventional fuel cells generate nearly equal proportions of electricity and heat, or even more heat than electricity. "With the old fuel cells, you had to make use of the heat to make them economical. With Bloom, that is not an issue," he said. "There is very little heat and the heat that is generated is used to heat up the fuel cells to make them run better." "Highways kick up a lot of dust," said Aaron. The boxes were shifted to a different orientation and all worked well. On average, electricity costs 8 to 10 cents per kilowatt hour over a ten-year amortization period, according to Bloom. The figure includes maintenance, fuel and other necessary costs. A key metric, however, will be maintenance. Will the ceramic plates work well over long periods of time, or will they have to be replaced? This could throw off the economics of the system. When Bloom launched in February, the company had 20 of its Energy Servers installed. The number is now up to 50 and by the end of the year, Bloom hopes to have 100 installed. Here's a video with CEO K.R. Sridhar. He can answer your additional questions.